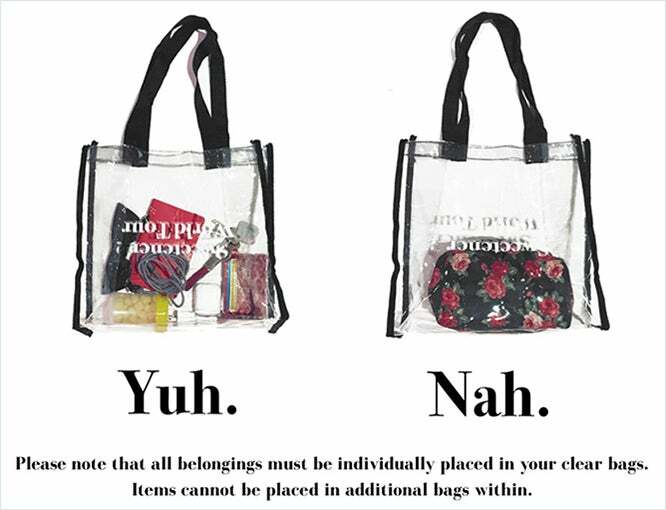 - All bags must be clear plastic, vinyl or PVC and do not exceed 12" x 6" x 12". - An exception will be made for medically necessary items after thorough proper inspection at a gate designated for this purpose. You are welcome and encouraged to bring your own clear bags for your belongings, and if you'd like there are three different official Sweetener World Tour bag options you can purchase at arianagrande.com. They will also be for sale at all venues and are reusable. We appreciate your help in creating the safest, most enjoyable experience for all of the fans attending the Sweetener World Tour.